Giovanni Francesco Barbieri, called Guercino, A Study for Hercules, in three-quarter-length, 1640s. 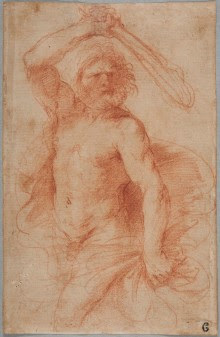 The Nationalmuseum has acquired a red-chalk figure study for a Hercules, in three-quarter-length from the 1640s by the Italian Baroque artist Guercino. The drawing that in the 18th century belonged to the Swedish diplomat and art collector Count Carl Gustaf Tessin has thus been reunited with the main part of his drawings collection in the museum’s holdings.